PowerMyLearning’s strong financial health and commitment to accountability and transparency have earned it a 4-star rating from Charity Navigator, America’s largest independent charity evaluator, as well as the 2018 Platinum Seal of Transparency from GuideStar. This is the 11th consecutive year that PowerMyLearning has earned this top distinction. Only a quarter of charities rated by Charity Navigator receive the distinction of our 4-star rating. 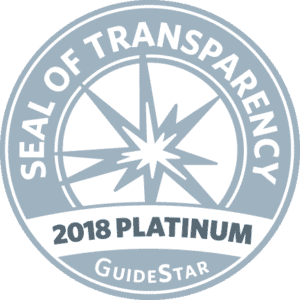 The Platinum Seal of Transparency is the highest level that an organization can attain on GuideStar, placing PowerMyLearning in front of over 9+ million annual GuideStar visitors. 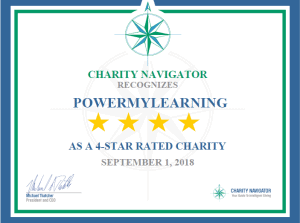 According to Michael Thatcher, President & CEO of Charity Navigator, a 4-star rating sets PowerMyLearning apart from its peers and demonstrates its trustworthiness to the public. At PowerMyLearning, we believe that students are most successful when supported by a triangle of strong learning relationships between students, teachers, and families. We partner with schools and districts nationwide to transform teaching and family engagement through innovative coaching and workshops, and through our award-winning digital platform, PowerMyLearning Connect. As a non-profit, PowerMyLearning is especially committed to students from low-income communities, students with learning differences, and English Language Learners. PowerMyLearning is and has always been committed to following best practices around accountability and transparency, and we will continue executing our mission in a fiscally responsible way. PowerMyLearning hopes that these recognitions from Charity Navigator and GuideStar will reinforces donors’ trust. For more information on PowerMyLearning’s accolades, please visit PowerMyLearning’s Charity Navigator page and view our Platinum Level Profile on Guidestar.